If you want to understand what our God is up to in the world today, this is it: He wants to see the whole earth filled with the knowledge of his glory as the waters cover the sea – completely saturated. Paul and Barnabas had to rush out into the crowd to stop them, and then to go on to share the knowledge of that glory with these men, which led to a large number becoming worshippers of the true God. Today there are millions worshiping all kinds of false gods around the world, ascribing to them the glory that is God’s, just because they lack the knowledge of that glory. This is our call – to declare his glory among the nations. The preaching of the Gospel like Paul and Barnabas did in Lystra is how we declare that glory. It is in the face of Christ Jesus and his finished work on the cross, that men come to know the glory of God. According to joshuaproject.net there is presently a total population of 3.14 billion people who are unreached (or unevangelised). These are nations who have had little or no chance to hear the Gospel. 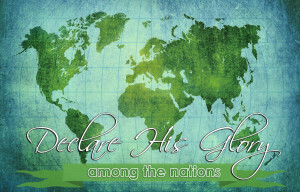 This then is our call – to go and declare his glory among the nations. Let those who have not heard, hear and turn to him. All the unreached nations need to hear of his glory. If you want to find out more about how you can be actively involved in declaring his glory among the nations, please contact me by replying to this devotional. May all the nations worship him!